Their motto is “just bring your clothes” and they’ll provide the rest of the fun for a perfect vacation getaway. Located further down the Galveston Seawall, towards the West End, near 69th St. you’ll find The Dawn beachfront condos. Recently renovated The Dawn Condominiums looks like a colorful bag of pastel Skittles. It offers large patios with ocean views, an oversized clubhouse and luxurious interiors. The Dawn grounds house two resort style pools, a hot tub and full fitness center. 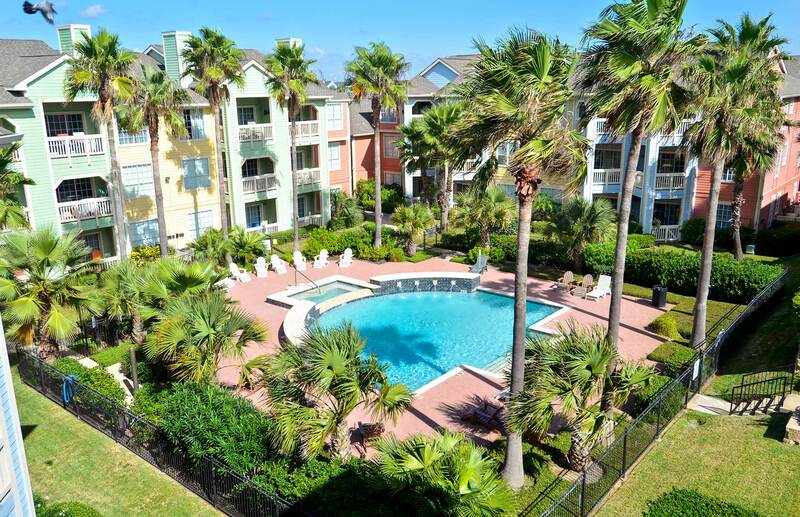 These Galveston condos are elegantly furnished with living and dining areas and flat screens with cable included. The kitchens are fully stocked with pans and dishes to make breakfast, lunch or dinner but you’re so close to all the delicious places to eat, you may want to take a timeout from cooking. Step out on your patio and hear the waves, feel the wind blow against your face and enjoy the ocean views. If you’re up for fishing then just walk over to Galveston’s 61st Street Fishing Pier, it’s 24 hours. If you get tired of fishing, The Dawn Condominiums is located right next to Premier Cinema, Galveston’s movie theatre and here you can take in the latest new release flick. If you want a more unique island experience then check out Galveston Island Horse & Pony Rides and tour the beaches in a new way. If you want to be in the middle of everything and meet some new people, then head over to Stewart Beach where there’s always something going on. From Jet Ski rentals to banana boat rides, the water sports and activities are endless on this end of the island. If after all of that you have the strength to go out to eat then Downtown Galveston or The Seawall will provide you a plethora of restaurants to choose from. The Black Pearl is a hidden gem but The Spot is Island famous. However, if you’ve worn yourself out with too much fun in the sun or forgot to use sunscreen and are coated head to toe with aloe gel, no worries Galveston delivers. Head back to your cozy Galveston condo and pick up the phone and order in from the comfort of your king sized bed. Many places like Mario’s, Russo’s and JJ’s will bring your dinner right to your door. You can’t go wrong with a vacation at The Dawn.